Take the industry's top NFPA 72® training to improve fire alarm and signaling system safety and compliance. This renowned 3-day program is fully updated for the 2019 edition of the National Fire Alarm and Signaling Code®. After the training, earn your Certificate of Educational Achievement* online! Advance your expertise with fire alarm and signaling system design and installation through 3-days of interactive classroom training developed by NFPA®, the Code source. Expert-led instruction covers the changing role of traditional fire alarm systems and how to interpret and apply NFPA 72 correctly and efficiently. 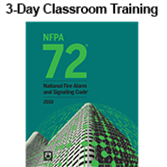 Taught by industry authorities, the training is fully updated based on the 2019 edition of NFPA 72, National Fire Alarm and Signaling Code. Don't miss this valuable opportunity for system designers, installers, contractors, project managers, and authorities having jurisdiction. In addition to new technologies and major revisions in the Code, the activity-rich training program covers the latest requirements for circuits -- including Class N circuits -- and pathways; interconnected fire alarm control units; emergency control functions; initiating device identification, spacing, and placement; supervision station alarm systems; inspection and testing of equipment; and other topics. A Certificate of Educational Achievement is available after the class through an online review and exam. After attending classroom training, review key concepts online and take the online exam at your convenience using the web link provided. You can prepare for the test at your convenience, using online tools for review. Passing the exam will earn your Certificate of Educational Achievement*, confirming your course knowledge. Earn 21 hours or 2.1 Continuing Education Units for this 3-day NFPA 72 Classroom Training. Attendance is required to earn CEUs. Please verify applicability with your professional board or organization before attending.